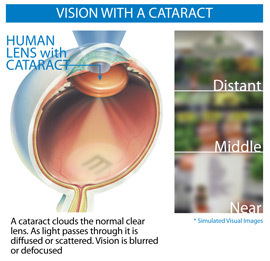 A Cataract is caused when the natural lens becomes cloudy and interferes with the vision. There are many types of cataract, the most common is the one associated with aging, in fact 50% of people over age 60 have some cataract formation. However most patients choose to ignore their cataracts and leave them untreated. 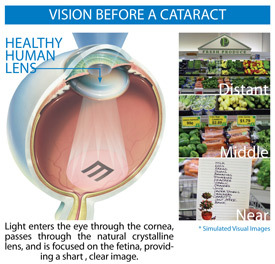 When untreated cataracts diminish the ability to see clearly, and eventually complete vision loss. 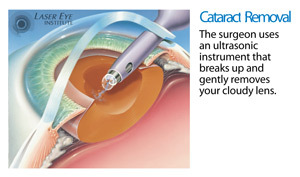 Cataracts are using a 2step procedure. First Dr. G.N. Qureshi uses an ultrasonic instrument to break up and gently remove the existing cloudy (cataract) lens in the eye. 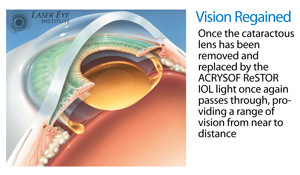 Next Dr. Qureshi replaces the removed lens with an artificial intraocular lens (IOL), the lens is rotated into place and the soft arms gently unfold to hold it into place. The entire procedure takes approximately 7 minutes and is done as an out-patient procedure. Afterwards Dr. Qureshi sees his patients the same for a quick post-operative check, and 1 week later for an additional post-operative check. As a specialist in Vision Correction Dr. G.N. Qureshi, over the last 15 years, has performed over 20,000 cataract procedures. As one of the leading cataract surgeons in the state Dr. G.N. Qureshi served as the M.D. of the Laser EYE Institute karachi Pakistan, and lectured nationally on refractive vision correction. With Dr. G.N. Qureshi`s surgical skill and vast knowledge most of his patients are able to see without the need for glasses after the cataract procedure. In addition to lecturing nationally on Cataracts Dr. G.N. Qureshi has an ongoing training course for other doctors: treatment of astigmatism in the cataract patient. Most patients having cataract surgery, receive some form of astigmatism correction performed during the cataract procedure. Up until recently most patients would require some sort of reading glasses after cataract surgery. This was a physical limitation of the implanted lens being use (monofocal lens), the lenses only focused on distance. Recently Alcon introduced a multi-focal IOL (ReSTOR) that allows patients to not only treat their cataract, but improve their vision. 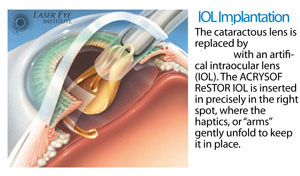 The ReSTOR lens is used in place of a standard IOL and after the ReSTOR lens, most patients are able to see close objects without the need of reading glasses!